MANILA, Philippines — Senator Joseph Victor “JV” Ejercito on Thursday challenged President Benigno Aquino III to categorically make his stand known on the Freedom of Information bill when he delivers his state of the nation address on Monday. “Umaasa ako na sa darating na SONA ay maipahayag niya ang kanyang katayuan sa isyu na ito. Para sa akin, walang totoong matuwid na daan kung walang FOI (I am hoping that during the SONA he will make known his stand on this issue. For me, there can be no straight path without the FOI),” Ejercito said. “Kung tunay ang kagustuhan ng ating pangulo na tumahak ang buong bansa sa daang matuwid dapat lang na bigyang pansin ni PNoy ang FOI at i-certify ito bilang ‘urgent.’ Hindi makatuwiran na isantabi lamang ang isang panukala na alam nating magbibigay ng tunay na matuwid at maliwanag na daan, para magkaroon ng totoong linaw at pananagutan ang bawat transaksyon na pinapasok ng gobyerno (If our president truly wants the country to travel down the straight path then Pnoy should address the FOI and certify this as ‘urgent.’ It is not right to set aside this bill thay we know will pave the way for a truly straight and bright path that will give us transparency and accountability in all government transactions),” he added. Yet, although enacting an FOI law was “one of the main campaign promises” Aquino made, Ejercito noted that soon after becoming president in 2010, he developed “a cold attitude” towards the passage of the measure. During the first half of his six-year term, Aquino never certified the measure as urgent and even his allies in Congress acknowledged that passing the bill had not been among his priorities. Stung by Aquino’s failure to live up to his promise, freedom of information advocates have filed the “people’s FOI bill” in both houses of Congress as part of an indirect initiative to push the measure. 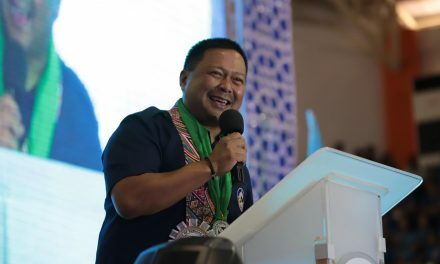 “People need to and must know how public officials exercise their powers and authorities, how they spend public funds, what contracts and agreements they sign and seal on our behalf … The right to information is our protection against government abuses as it is also our power to make government accountable,” Ejercito said. This, he added, was especially needed for major budget items such as the Conditional Cash Transfer program, the Special Purposes Fund, and not just the Priority Development Assistance Fund or pork barrel. “Hindi naman tama na ‘yung mga congressman at senador lamang ang uusisain natin na bugbog na bugbog na sa isyu ng PDAF, samantalang P24.89 billionlamang ito na pinaghahatian para ipamahagi ng halos 300 congressman at senador. Wala ito sa kalahati ng kabuuang pondo ng DSWD (Department of Social Welfare and Development) para sa kanilang CCT implementation na tinatayang aabot sa P66.8 billion na pamamahalaan lamang ng isang Cabinet secretary at lalo na ang SPF na hindi nalalaman ng publiko kung magkano at saan ginagamit (It is not right that only congressmen and senators are scrutinized and criticized on the issue of the PDAF, when only P24.89 billion is divided among almost 300 congressmen and senators. This is less than half the total budget of the DSWD for their CCT implementation, which is estimated to total P66.8 billion and is administered only by a single Cabinet secretary, and especially the SPF, the amount and use of which the public has no knowledge of),” Ejercito pointed out.